With pundits asking, "How did he win?" this book explores whether there was a supernatural element involved. Christian leaders prophesied before the election that God had raised up Donald Trump to lead the nation through a time of crisis. But could this billionaire reality-TV star actually convince the voters he was for real? If so, what is God doing now, not only in Donald's Trump's life, but also in the life of the nation? Trump is an enigma, a brash self-promoter, casino owner, and man of the world. Yet he is also a devoted husband and father who has surrounded himself with men and women of faith and has made religion a key component of his image. God is on the move in the US ! Donald Trump (whether he's a Christian or not) has without a doubt been anointed by God for a time like this. The parallels with Cyrus The Great in the book of Daniel are striking. An important read if you want to find out about the spiritual and ecclesiastical machinations behind the Trump 2016 campaign. Highly recommended. A well documented and detailed insight to President Trumps God ordained destiny, I enjoyed this book. Great insight into the Christian support of President Trump. As a Roman Catholic, I found the epilog extremely interesting, but also the entire read. Is Trump perfect? No. And there is no attempt to portray him that way. But more importantly, does God choose imperfect people to accomplish His will? Absolutely. David, Paul, Peter, and Sampson are only a few imperfect examples in the Bible. This book impressed upon me...or rather, reminded me of the sovereignty of almighty God and that He still works in mysterious ways. This book has strengthened my faith. 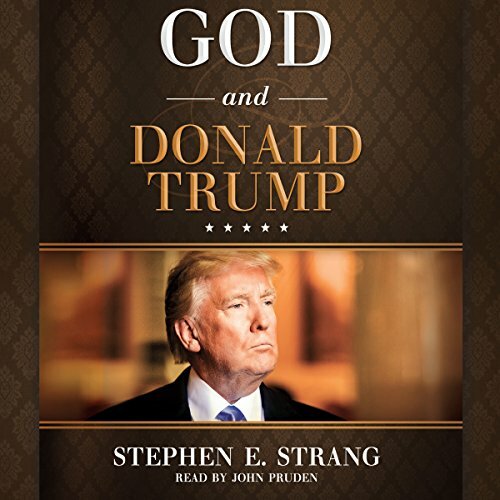 Greatest audio book on President Donald J. Trump's Election from an evangelical perspective! Very powerful! Appreciated the lay out of explaining why Trump was elected. It answers some questions. I didn’t vote for him but I will 2020. I could listen to this audio book again bcuz it felt supernatural. What an answer to prayers. Wipes away the blind rhetoric and relays the facts. Lets the reader decide based on facts rather than opinion. Are you strong enough to consider the facts to make your own mind up, or do you need others to tell you what you should believe? If you do not want to think for yourself, this is not the book for you. An amazing read something I did not expect. I recommend this as a source of light. If you want to know the back story of the 2016 election, this is a must read. Especially if are a person of faith, a bible believing Christian, and a patriot. Like it or not, God put Donald Trump in the White House for such a time as this! First off, the narrator was good. I liked his pacing and thoroughly enjoyed his presentation. Now what he was presenting is a whole different matter. The author uses the same tired arguments regarding liberals. Let him tell it, all liberals are evil and are only taking their political positions in order to corrupt the nation. Whatever is wrong with this country morally started long before former President Barack Obama took office in 2008. This author knew that Republicans, Conservatives and The Tea-Party movement hated the former president. It wouldn't have mattered if Obama could have spun gold out of thin air or waved his hand over a globe of the world and pronounced peace, and it became so. They still would have hated him. And any truly thoughtful person knows the reason why. The author portrays President Donald Trump as a kind of savior according to the evangelicals. President Donald Trump is rude, crude and abrasive. So many of his tweets are offensive. This author white washes those tweets as though they were something written by Shakespeare. President Trump's behavior during the republican debates and the debates with Hillary Clinton was a disgrace. All of the sexual innuendoes and negative comments against the other presidential candidates was a shame to this nation. The author swept over President Trumps disgraceful behavior only to pump him up as a kind of Messiah. As an author he has a right to his opinion and as a reader I have a right to mine. This book is just a puff piece. President Donald Trump is a shrewd and politically aware man. He and his associates knew that Americans were not going to vote for a woman under any circumstances. She no more corrupt than the president himself. This president was voted into office because the American people are angry. President Trump fed into that national anger and parlayed our discontent to a seat to the highest office in the world. And as we know, anger tends to make people irrational. I'm talking about the kind of anger where someone is pointing us in the direction of hating our fellow man because they think differently that us. It's worrisome that people say that this is a "Christian Nation". Never has been, never will be. What evangelicals want is a kind of theocracy with their so called conservative organizations at the head of it. We live in a constitutionally limited republic where laws and not men are the governing factors. President Trump played us like a fiddle. He tapped into the fears, anger and regrets of this nation. I'm not mad at him. He's just a man that used every trick in the book to get elected. In that respect, he's just like the others that got elected as president. Men and not gods are running for office. Seems like this author has forgotten that. An incredible book about how prayer delivered God's people from the forces of darkness and evil. This book is 99% on the money, the only thing that concerns me is why would a racist song be sung as the national anthem. The 3rd stanza talks about killing slaves. For some reason it’s not normally sung. I say from London, England, God bless America, Pres Trump and May God’s Glory sweep the nation like a gigantic sun Ami.